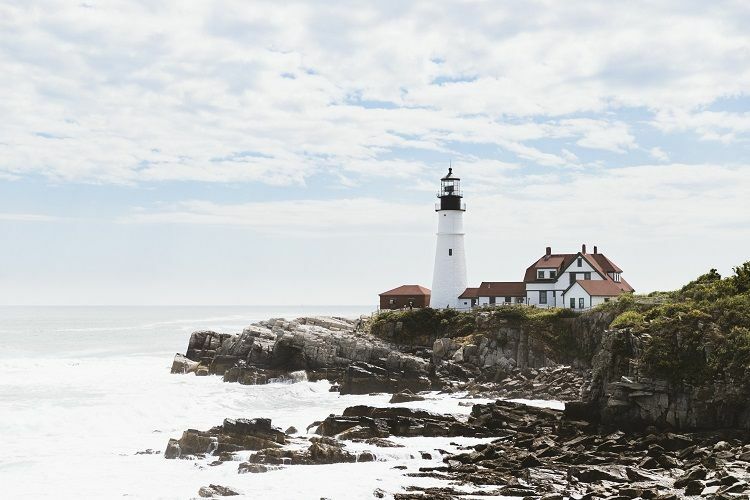 Arguably the most beautiful region in the United States, New England is surely the ultimate holiday destination for anyone whose idea of a perfect getaway involves fascinating historical attractions, great food and drink, and stunning coastal scenery. It would take all the time in the world to explore every facet of the six states that make up New England – Maine, Vermont, New Hampshire, Massachusetts, Rhode Island and Connecticut – but here, we will do our best to give you some pointers on the places you should definitely not skip on your upcoming visit to this wonderfully unique and relaxing part of the American Northeast. ‘Many visitors are drawn to New England because of its bucolic charm. They imagine a postcard-like scene of a New England farm, protected by its hand-built stone walls and backing up against mountains glowing in vibrant oranges, reds, and yellows in autumn. Yet New England is as varied as the rest of the United States, ranging from luxury mansions to working-class towns. However, if you only have a short time to visit, you will want to hit a few must-see highlights. ‘The port cities of Newport, Rhode Island, Boston, Massachusetts, and Portland, Maine are must-dos on any New England trip. Not only is Newport the yachting capital of the world, it is also where New York society used to summer. Today you can enjoy time on the water and touring some of the “cottages”, which may convince you that if America doesn’t have royalty, it certainly has palaces. ‘Boston is brimming with the history of the American Revolution. From the Boston Tea Party Ships and Museum to walking the famous Freedom Trail, you can get a view of history from the other side of the pond. While Boston is full of history, Portland is all about the food. 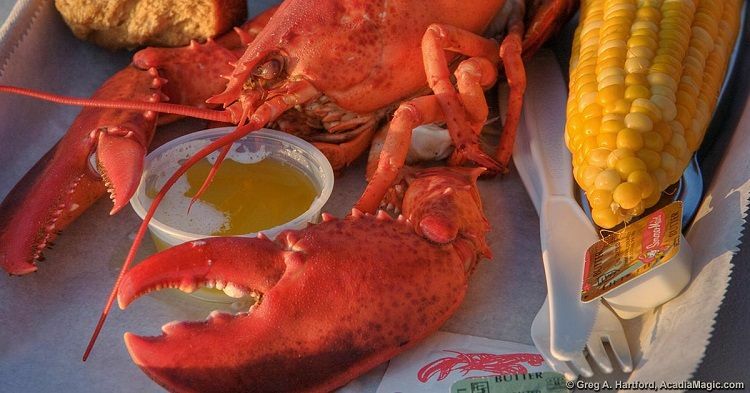 You can take a lobster boat tour or just sample some of the freshest lobster right off the dock at the Portland Lobster Company. The Old Port district is filled with culinary gems and shops, while craft beer lovers can hop on a tour to visit some local breweries. 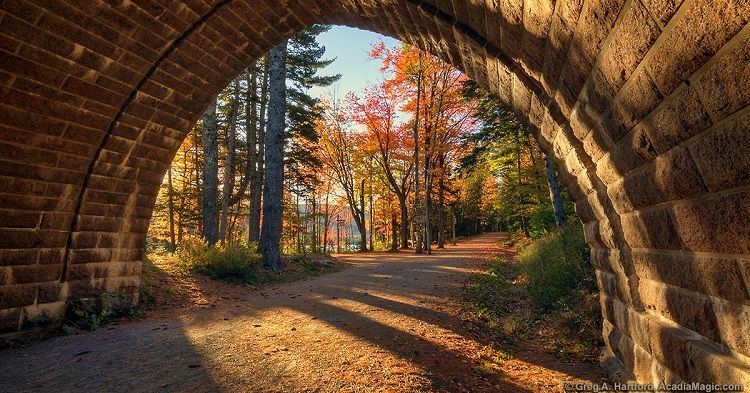 As Tamara alluded to, one of New England’s greatest pulls for visitors is the unrivalled variety and beauty of its natural landscape. 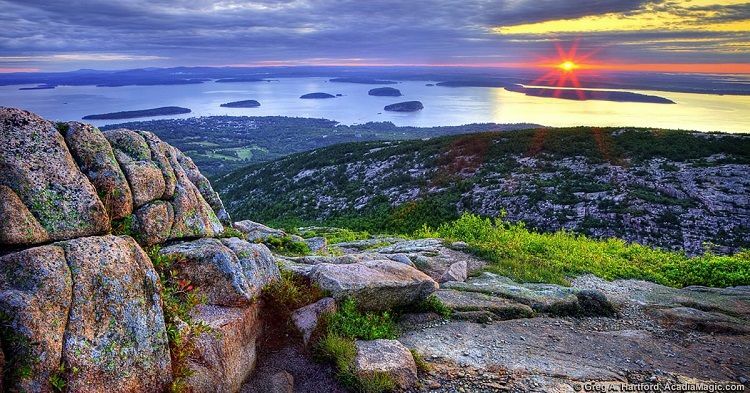 And, whilst each of the region’s six states has enough in the way of stunning scenery to keep even the most energetic of explorers happy, arguably the finest example of all is Acadia National Park, which can be found in Maine. ‘The northeastern section of the United States is referred to as New England. The State of Maine is furthest to the northeast. 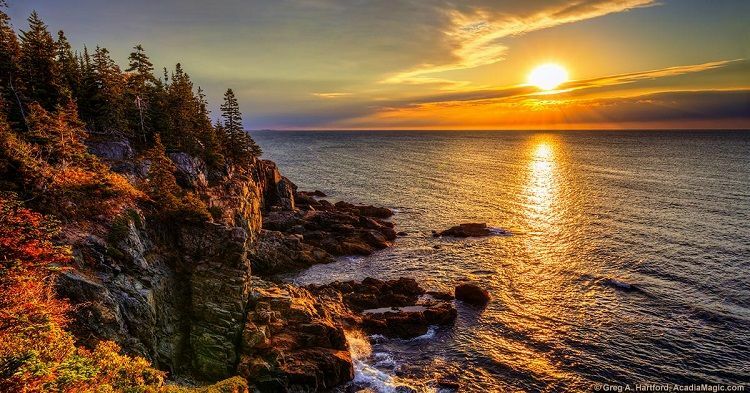 On its southern coast is a wonderful gem of a park called Acadia National Park. Most of it is located on Mount Desert Island (pronounced “de-ZERT”), the second largest island on the eastern seaboard of the United States. The park encompasses a total of 49,052 acres (19,851 ha) with 30,300 acres (12,300 ha) being on Mount Desert Island. ‘Even though this is in a northern state, the temperatures remain rather temperate due to the Gulf Stream that moves up along its coast. The best time of year to visit is from May through October. July and August are its busiest months. Once September arrives, the crowds decrease and people who hope to see the autumn colours that New England is famous for begin arriving. Peak colour time is usually in the first three weeks of October. ‘The stunning beauty of this area is undeniable. Maine is known for its “rugged” coastline and there certainly is much of it here. 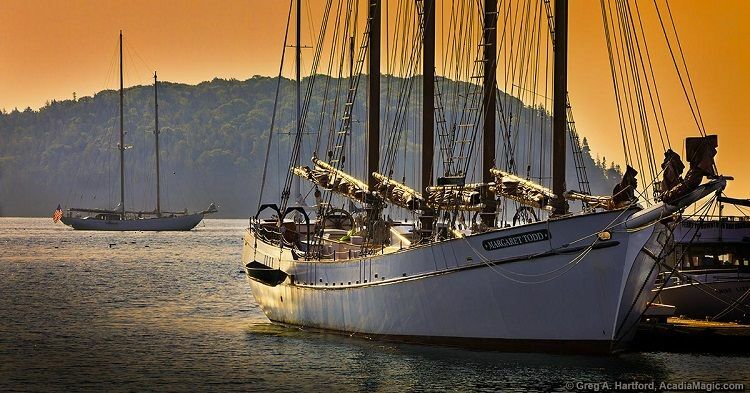 The mountains, as many as 26, greet the ocean in a spectacle that is combined with hundreds of inlets, coves, fishing and sailing vessels, and charming villages imbued with what is called “Down East” character. 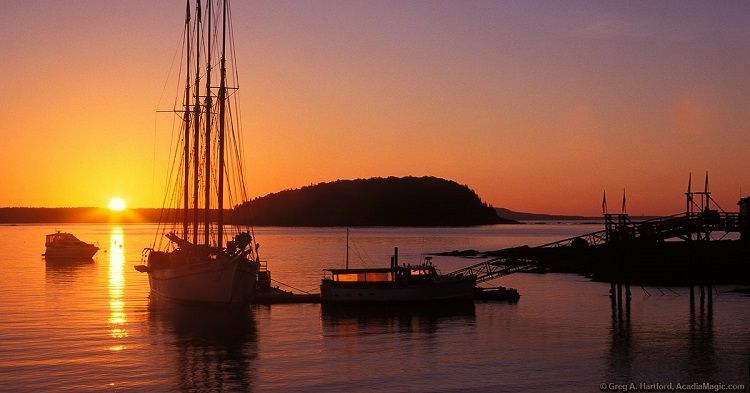 ‘Bar Harbor is the most well-known town on the island and is regarded as Acadia’s main host. 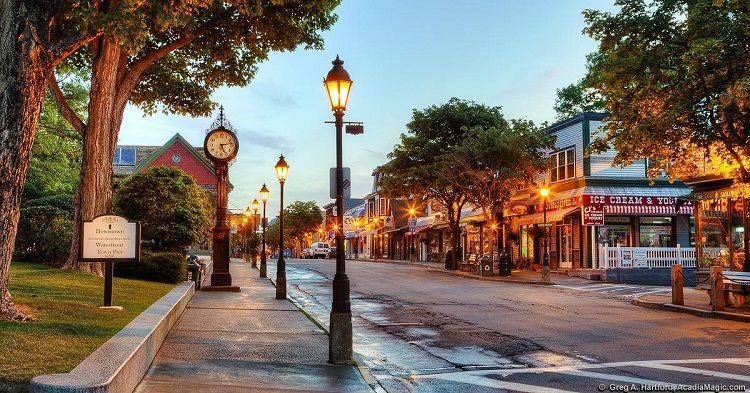 Located on the northeastern part of the island, it has many shops, restaurants and pubs as well as many choices for lodging from vacation rentals and bed & breakfasts to inns and hotels that are often right next to the ocean. There are, however, several other coastal towns and villages that border the park such as Southwest Harbor, Northeast Harbor, Seal Harbor and Tremont. 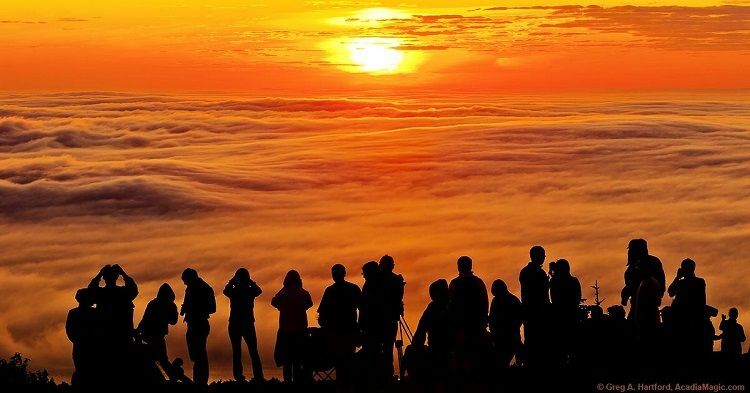 ‘Some of the “must-visit” places include Cadillac Mountain (the highest mountain on the island), Sand Beach, Thunder Hole, Otter Cliff, Jordan Pond, and the Carriage Roads which were originally built by John D. Rockefeller, Jr. as roadways for horses and carriages. They meander throughout the park on the island and are available for walking, hiking, biking and horse-drawn carriages. No motorised vehicles are allowed. As we have often noted in previous blogs, eating out at high-quality restaurants is truly one of the best things about going on holiday. 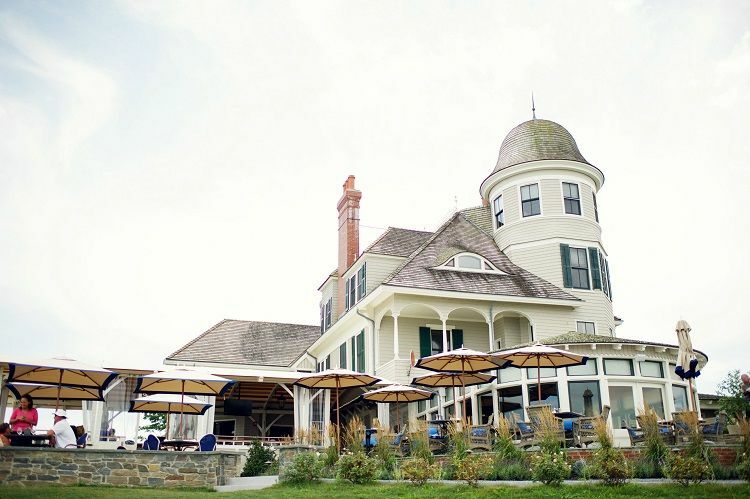 It will come as no surprise to learn that New England, with its proximity to the sea and centuries-long history of attracting affluent visitors, has become something of a magnet for the US’s most celebrated chefs and restauranteurs. Whether you are hoping to spend your entire trip indulging in the region’s world-famous seafood or would prefer a more varied menu, you are sure to find plenty of high-class eateries here to sate your appetite. 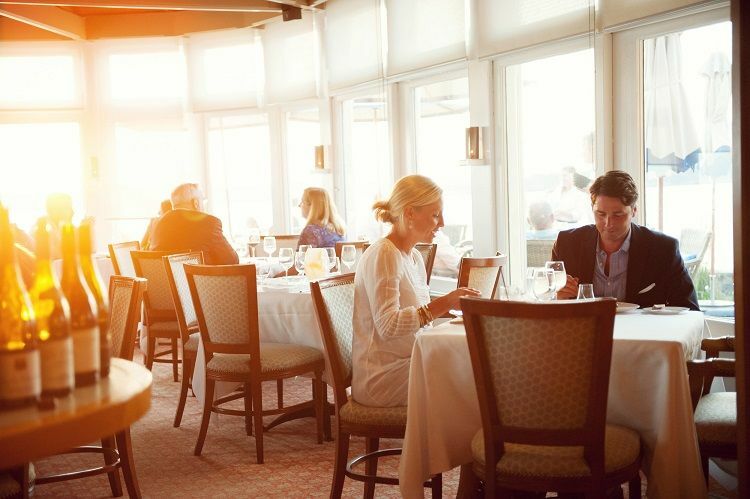 With six states of culinary mastery to choose from, we could have highlighted any number of wonderful restaurants, but have chosen to focus on just two locations which, in different ways, epitomise New England and its gastronomic heritage. Our first recommended location actually gives you the choice of two excellent restaurants – or you could try both! The luxurious and historic Castle Hill Inn (established in 1875) is home to both The Dining Room, which is a classic fine dining establishment committed to showcasing flavours from around the world via an innovative range of dishes, and The Lawn, which specialises in serving more casual (yet equally delicious) fare in an elegant waterside setting. 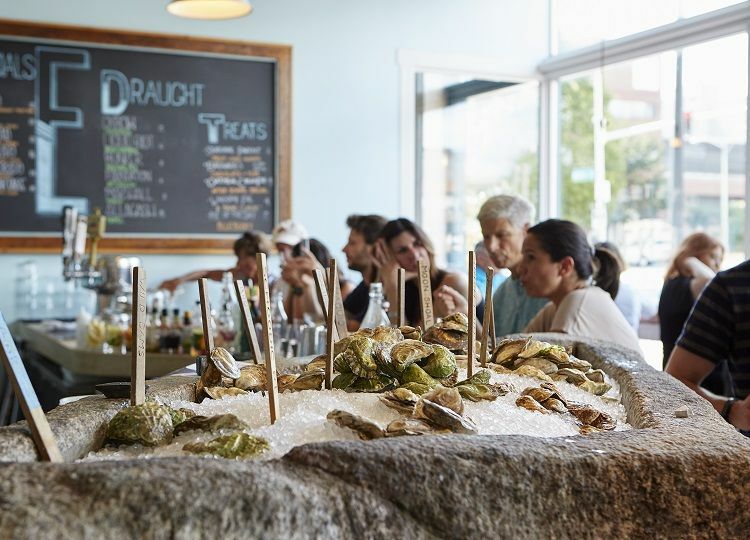 In the last few years, oyster bars have become all the rage in America’s most fashionable cities (New York in particular), and this trend shows no sign of slowing down. However, for the true taste of US seafood, you need to go back to the original source – the pristine waters of the Gulf of Maine. 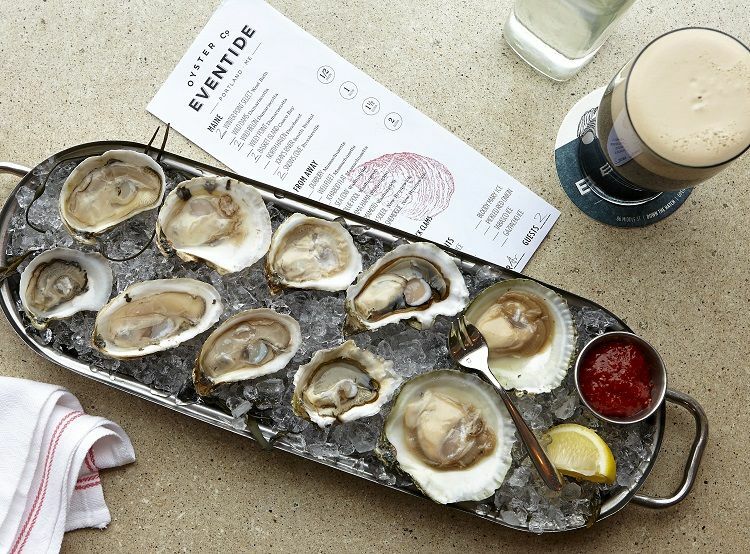 The restaurant’s most famous dish is displayed ‘on an ice-laden block of Maine granite known as “The Rock.” Here, you will find Eventide’s array of oysters both “From Maine” and “From Away”, which form the cornerstone of the menu. As much as fine food and drink is important, however, no cruise to any destination would be complete without taking the time to discover some of its cultural highlights. Fortunately, New England is among the most historically significant and culturally distinguished regions in the whole of America. 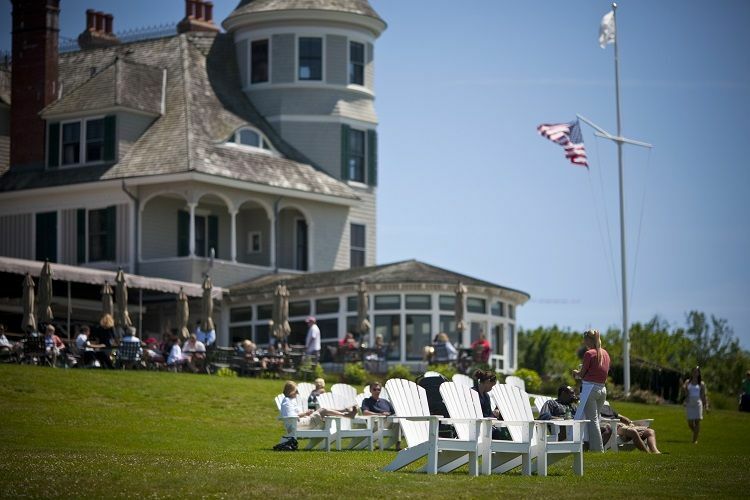 Whether it is attractions that bring to life the fascinating colonial history of Massachusetts (which you can read about in detail here) or the extraordinary selection of opulent mansions dotted throughout the county of Newport, Rhode Island, you will be spoilt for choice when it comes to ways of expanding your knowledge whilst visiting New England. 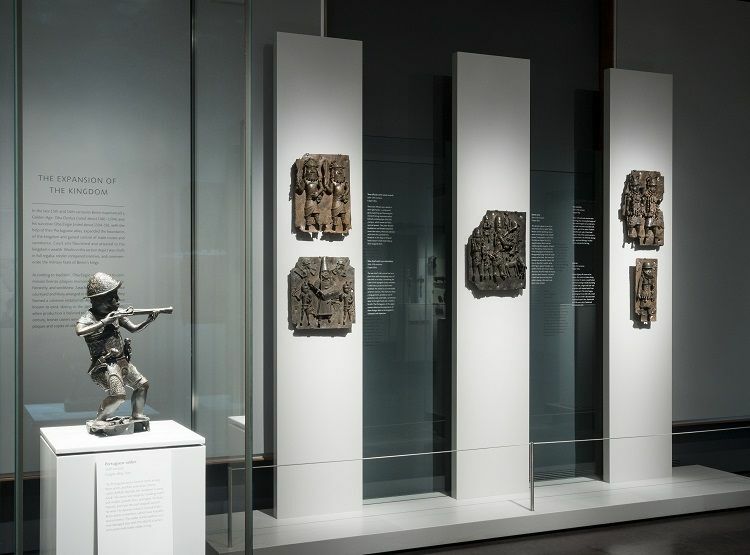 Widely regarded as one of the greatest and most eclectic institutions of its kind, the Museum of Fine Arts, Boston (MFA) really is the perfect place for art lovers to visit, whatever their favourite era or discipline may be. 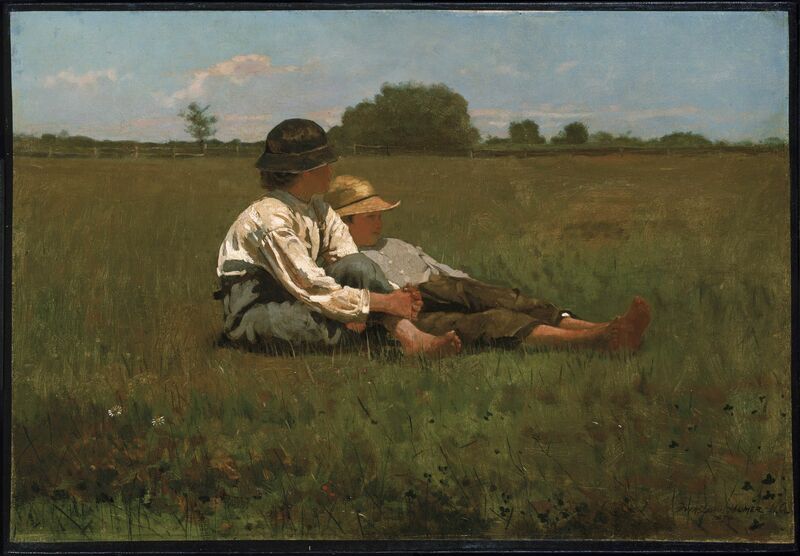 ‘The original MFA opened its doors to the public on July 4, 1876, the nation’s centennial. Built in Copley Square, the MFA was then home to 5,600 works of art. Over the next several years, the collection and number of visitors grew exponentially, and in 1909 the Museum moved to its current home on Huntington Avenue. ‘Today the MFA is one of the most comprehensive art museums in the world; the collection encompasses nearly 500,000 works of art. We welcome more than one million visitors each year to experience art from ancient Egyptian to contemporary, special exhibitions, and innovative educational programmes. As is well-known, the state of Massachusetts is arguably the most historically important place in the whole United States, having played a key role both in the nation’s founding and numerous significant events that have taken place in the centuries that followed. It was noted earlier in the article that Boston is a particularly unmissable destination for those interested in learning more about the region’s – as well as the nation’s – colourful past, and one place in which you can really immerse yourself in this history is at the city’s famous Faneuil Hall Marketplace. ‘History flourishes at Faneuil Hall Marketplace, as it sits in the heart of Colonial Boston, where the American Revolution began. 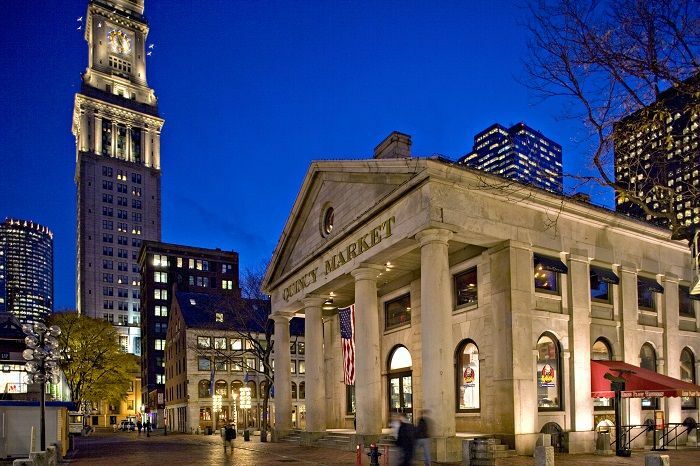 Take a stroll back to the 1800s with the Historic Walking Tours of Quincy Market, when the population of the city of Boston was exploding and Faneuil Hall was host to food merchants in pushcarts trying to keep up with the newcomers and their need for good food. Adjacent to the Marketplace visitors will find historic Faneuil Hall, which has been operating for 275 years as a site for meetings, protest and debates. ‘Upon entering the property, visitors will find activities, events and performances both inside and outside the marketplace, suitable for all ages. Faneuil Hall Marketplace is known to have some of the best street theatre in the country, with world-famous variety acts including jugglers, contortionists, acrobats and pogo-ists which captivate visitors year-round with their one-of-a-kind acts. 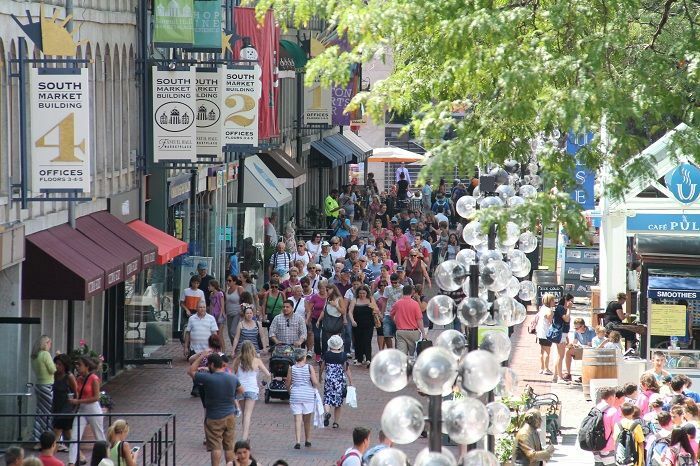 After reading this article, we are sure you’ll agree that New England is a destination that really does have it all. Whatever the ages or tastes of your party, and however long you plan to visit for, you will simply never run out of brilliant things to see and do in this magnificent corner of America. Be sure to keep checking our cruise offers page to stay up to date with our latest great value deals for holidays to New England and a wide range of other amazing locations.